MELBOURNE has withstood a spirited last quarter challenge from Carlton to win the NAB AFL Women's fourth-round game by six points at Casey Fields. The Demons improved their win-loss to 3-1 to stay in contention for the Grand Final, but it was a close call. Carlton booted three goals in nine minutes early in the last quarter to cancel out a 19-point deficit at the final change. Forward Bella Ayre, with two goals, and another from Bianca Jakobsson locked up the scores as it seemed the late-charging Blues would replicate a practice match victory when they booted six unanswered goals in the last quarter for a 43-point win at Ikon Park in January. But the Demons stood firm this time and the breakthrough came when Richelle Cranston slipped away unguarded as they surged forward inside the last four minutes. Cranston ran onto a loose ball and goaled on the run from close range to seal the heart-thumping victory. Carlton paid the price for wasted opportunities with a 28-22 inside-50 advantage, but Melbourne controlled play for large periods of the game, finishing with a 386-259 possession lead. In such a defence-dominated contest, it was critical to grab scoring opportunities, particularly from set shots. Melbourne's Alyssa Mifsud slewed a shot out of bounds and then Carlton's Nat Exon hit the post from a much more friendly angle. The Demons broke the deadlock early in the second quarter, predictably set up by Daisy Pearce, who finished with a game-high 28 possessions, released her midfield mate Elise O'Dea with a timely handball to run into goal on the run. But the Blues hit back hard when a Kate Sheirlaw tackle earned a free kick and the rookie made no mistake for the visitors' opening goal. And they grabbed the lead when the hard-working Darcy Vescio goaled from a free at close range. Melbourne paid the price with turnovers from the frantic play-on style and Carlton always looked dangerous with its more direct approach down the middle of the big ground. The Demons edged ahead again when Mifsud conjured an unlikely goal with a quick banana kick under pressure when seemingly hemmed in near the behind post. And when Shelly Scott marked and goaled, they took a five-points lead into the main break. It seemed Melbourne was coasting to a big win until Carlton launched the last quarter fightback that nearly snatched an unlikely win. Carlton coach Damien Keeping wasn't interested in the blame game for Melbourne forward Richelle Cranston slipping away for the match-winning goal. Keeping said it was the unfortunate aftermath of instructions to his players to dare to take the game on, when it was seemingly out of reach at the last change. "It's easy to isolate just that moment. We were playing a really aggressive type of football at that period, and we had to with our backs against the wall. "They (the Demons) are great at getting back behind the football once they get it and they got out the back on that occasion. I don't think it comes down to just that one moment. Certainly that will be highlighted, but there were some opportunities that I think we missed," he said. Medical scans on Monday will be critical for Melbourne's push to make the Grand Final. 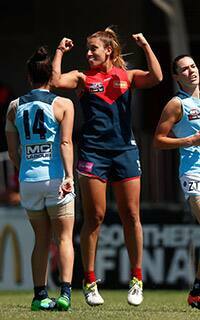 Prolific midfielder Karen Paxman pulled up with hamstring soreness and forward Shelley Scott may have shoulder damage. Both will need more detailed checks despite finishing the game. Paxman ran out the contest with an impressive 24 possessions and Scott had attention to an AC joint in the opening quarter before returning to the action. Carlton hasn't given up hope of a top-two finish despite agonisingly close losses to Adelaide and now Melbourne. Keeping said the players' development was far deeper than simply the final scoreboard that leaves the Blues at 2-2 after four rounds. "(It's) easy to go to the scoreboard and say we missed by three points last week and six points this week, but as we're progressing through the program, all the girls are coming out of it with some positives that are working to the type of game we want to play," Keeping said. And Stinear said a close finish was valuable for his players on how to regain control and composure during a game's momentum shifts. "It's hard to replicate that at training and the girls were able to live and breath it and survive it," he said. Young Demon forward Alyssa Mifsud continued to develop as a key forward with two goals to follow the three against the Western Bulldogs in the previous round. Mifsud found a way when corralled near the boundary line in the second quarter. She threaded a deft banana kick from the tight angle for a crucial goal after the Blues had kicked the previous two to grab the lead. Melbourne has its first road trip to play the GWS Giants in Sydney next Friday and Carlton hosts the Western Bulldogs at Ikon Park next Saturday.